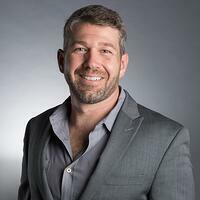 UN is led by Ian Evenstar and comprised of designers, developers, producers, and marketers that are serious about delivering the best solutions and results to their clients. Ian has spent 18 years guiding clients through the branding process. As the head of UN, Ian implements his extensive experience in web design, advertising creative, and digital marketing. 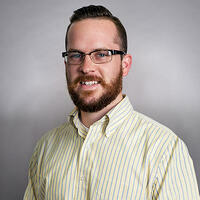 Brady is a HubSpot, Google AdWords, and Google Analytics certified marketing pro who builds content strategies and architects marketing automations that drive conversion. Robert has over 8 years of experience in marketing and advertising, and works closely with UN’s clients to develop winning strategies that generate more leads and revenue. At UN, we utilize several key tactics to get the most out of our client’s content. Though content marketing is just one piece of the bigger puzzle, it can drive significant business results. The Strategic Marketing Methodology is a proven method for growing your business, and there are many statistical advantages to building an inbound marketing strategy vs. relying entirely on paid media or advertising. A well researched content strategy separates the best content marketers from everyone else. It includes everything we know about our customers and informs just about everything we’ll do to convert website visitors into new customers. Although the weights of on-page elements such as URLs, titles, headers, have decreased in favor of engagement metrics like dwell time and click through rate, they still play a large role in how to design your content for maximum SEO. At this point we’ve written our pillar pages, designed our content for SEO and engagement metrics, and clustered our topics. Now it is time to promote our content using any media or communication channels that your organization uses. Not all of your marketing campaigns will be winners. If your content is performing well, you might have yourself a “marketing unicorn”. Marketing unicorns are your top 1-3% of content that drives a majority of the traffic. The Strategic Marketing Methodology is a proven method for growing your business, and there are many statistical advantages to building a Strategic Marketing strategy vs. relying entirely on paid media or advertising. 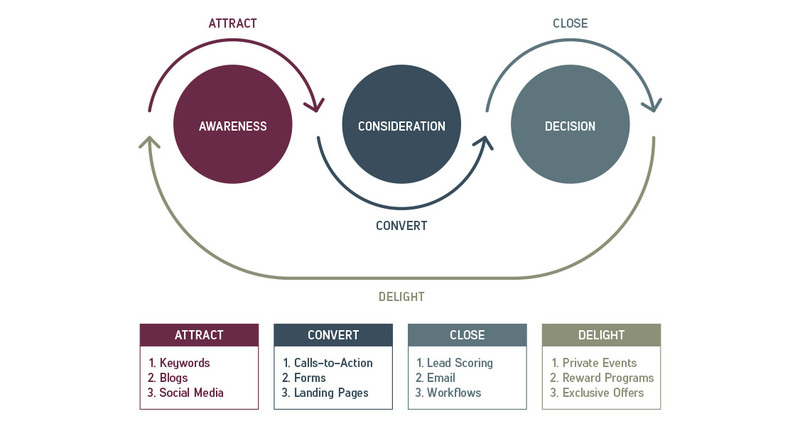 Strategic Marketing has four stages: attract, convert, close, delight. You have two methods to grow your business: get new customers or increase the lifetime value of existing customers. Of these two options, retaining an existing customer is 5-10 times more cost-effective than acquiring a new customer, but we can’t always increase the value of an existing customer. For the purpose of this guide, we’ll focus on the first method, finding new customers. Once you’ve attracted a prospective customer to your website through a marketing channel, you need to convert them to a lead. Converting a lead simply means capturing their basic information so you can begin actively engaging with them through other channels such as email, social media, or digital advertising. The most common method of converting a website visitor into a lead is through something we like to call a “ Lead Magnet” or an irresistible offer or incentive. This offer is commonly made in exchange for the visitor’s contact information. After a new lead has been added to your Customer Relationship Management (CRM) system like the HubSpot CRM, it is time to nurture them towards becoming a paying customer. There are many ways to close a converted lead, but for the sake of this guide we’re going to focus on content marketing and email nurturing. Email nurturing uses marketing automation tools to send the right message to the right person at the right time. The time to close a sale varies drastically across industries. However, when sales and marketing teams are aligned and your company leverages nurturing, you can significantly reduce the time to close a new sale and increase your closing rate. Now that you’ve converted a lead into a sale, here is where you’d focus on customer retention. Continually delighting them with relevant content or special deals help you to stay top of mind, while turning them into lifetime customers and brand advocates. 1. Maintain their business. This is a constant challenge for Software-as-a-Service companies who leverage subscription-based services. 2. Convert them into advocates. They happily spread the word about your business which results in new customers. 3. Increase their lifetime value (LTV) This occurs when existing customers purchase additional products or services to supplement their original purchase. As you can see, great content sits at every intersection of your customer’s journey within the Strategic Marketing Methodology. Working within the 4 stages we described above, there are also content stages. The 3 content stages are: Awareness, Consideration, and Decision. Awareness stage content is content that introduces your brand to a potential lead by answering a question or solving a problem your potential lead has. An example of awareness stage content for the higher education industry might be, “How can I advance my healthcare career?” . Visitor's Problem: How do I advance my career? University's Answer Continuing your education. For the sake of consistency, we’re going to use a fictional University as our client. Awareness stage content will mostly be used in the “ attract” stage of the Strategic Marketing funnel. However, it can also be repurposed to increase the lifetime value of existing customers by informing them of new product offerings. For example, let’s say you are a leader at a university that has been around for many years and has great brand recognition. Your university is known for specific types of education programs, but to stay current, you’ve created and launched new degrees tailored to the current job market. You’ll want to create content that describes these new programs, why they were created, and why they’re valuable. These could be blog posts, videos, or even a press release. Consideration stage content is content that prospective customers will look for when there are multiple solutions for their problem. Prospective Student's Problem: Which master's program is best for advancing my career? University's Solution: Evaluation stage content that compares the advantages and disadvantages of pursuing each degree within the context of career advancement. Consideration stage content will mostly be used in the “ convert” stage of the Strategic Marketing Methodology. Decision stage content is content that a prospective customer, or student in our case, will use to decide between their available options. Prospective Student's Decision: Which school should I apply to/accept an offer from? University's Solution: Compare the pros and cons of attending each school within your competitive ecosystem, within the context of career advancement. Decision stage content will mostly be used in the “ close” stage of the Strategic Marketing Methodology. Now that we all have a clear understanding of the different types of content we need to create, we can start preparing a content strategy and achieve content marketing success. A well-researched content strategy separates the best content marketers from everyone else. It includes everything we know about our customers and informs just about everything we’ll do to convert website visitors into new customers. Buyer persona research is critical to the ultimate success of your content marketing and it should not be skipped. This exercise requires you to put yourself in your customer’s shoes to document your customer’s demographics, pain points, and their journey. Buyer personas are fictional representations of your ideal customers. They help you understand your customers (and prospective customers) better and make it easier for you to tailor content to the specific needs, behaviors, and concerns of different audiences. Depending on your business you could have as little as two personas or as many as 10-20. What’s our advice? If you’re new to marketing, start small and start with your most valuable audience. You can always create more personas. For a clear, step-by-step process guide to developing your buyer personas, visit the UN resources page, or download this guide. If a buyer persona is your ideal customer, a negative persona, or exclusionary persona, is a representation of someone you don’t want as a customer. You might be asking yourself, why would I not want someone as a customer? That’s a great question. Not everyone is going to be a good fit for your technology, or the best customer. Negative personas provide a framework for how we engage with them. If the cost of a custom website is a concern, we recommend a branded, one-page website that is designed specifically to capture interest through a lead form. Another option is using a drag-and-drop website builder like Wix or Squarespace. Haven’t created your buyer personas yet? No problem. Download our step-by-step Buyer Persona Development guide. In this eBook you’ll learn how to create and use your buyer personas for content marketing success. Once you’ve researched your buyer personas (age, demographics, motivations, etc.) it is best to write a fictionalized story. Writing a story helps sales and marketing professionals visualize their customers from somewhat nebulous data points. For three great examples of what a buyer persona story looks like, check out HubSpot’s article, “ What Does a Great Persona Look Like”. Once you have a clear understanding of who your ideal and not so ideal customers are, its time to map the customer’s experience. A customer journey map is a map of all the touchpoints a customer has with your company, from the first time they hear about your business to when they become a paying customer. Given today’s era of social sharing, linking, and searching, you can no longer guarantee that users are coming to your homepage first, so it’s increasingly important to have clear and easily-understood navigation if you want to retain that user. If they land on a blog, but there’s no links to the next article, the homepage, or any other part of the site, they’re going to close out of your site without exploring further. We expect to have instant information at our fingertips, no matter where we are. Your site should work quickly and efficiently on any device, on any network. Be sure to optimize your site for mobile, but also keep in mind where your user will be when they’re on your site. For example, a music festival site should be able to load quickly despite spotty networks to ensure that the user can check out the upcoming acts while in line at the water fountain. One great solution for this is using Accelerated Mobile Pages (AMP) which are lightweight pages that load in fractions of a second. If your company uses HubSpot’s Marketing Platform, using Accelerated Mobile Pages is as simple as changing a setting. If nothing on your site changes, there’s no reason for users to come back. Consider what new content, offers, or features you can use to entice users to come back. At the very least, a blog should be updated 1x/week with content your users are interested in. 70% of users add products to the cart and then abandon the purchase, meaning a smooth transition from cart to checkout is vital to every ecommerce shop. As you’re reviewing your site, make sure you go through the entire journey, from initial search/product filtering, adding to the cart, and the checkout process, trying to find areas you can optimize, skip, or predict to make the process faster. Have you ever subscribed to a newsletter only to unsubscribe a few days later because the brand either inundated you with emails or pushed their product way too fast? When you go through the exercise of mapping the customer experience you can see first hand what your customers see. 1. Do your email marketing automations align with the customer journey? 2. Are you sending the right message to the right audience at the right time? 3. Do your nurturing campaigns help move visitors through your funnel? Customer journey mapping isn’t isolated to your website. It should also be viewed as an opportunity to research your customer’s best alternative to a negotiated agreement (BATNA). This is to say that your content marketing must distinguish your brand’s product offering from competitors that span the competitive ecosystem. There are many ways to map the customer’s journey: sticky notes on a whiteboard, modifying a spreadsheet, or using mapping software like Smaply. For higher education this might be: awareness, research, evaluating options, cost analysis, deciding, applying, accepting, and enrolling. For the greatest content marketing success it is imperative that you understand how your customers find and use your website to complete these stages. For the sake of time, we’ll look at the touchpoints for the first three stages and their goals. Throughout the customer journey visitors will return to your website many times in search of new information to address new questions. When brands are fully aware of their customer’s journey, brands can intelligently create relevant content. For advanced methods on customer journey mapping, check out Conversion XL’s “ Step-by-Step Guide to Customer Journey Maps”. Now that you have a clear and deep understanding of who your customer is and the path they take to become a customer, we can discuss content, keyword research, content topics, and clustering your content for search engine optimization. Content includes just about every form of media that is distributed and consumed online: videos, blogs, infographics, podcasts, research papers, etc. The type of content you create and the method you use for creating it depend on your business’ native strengths and capacity. The content you create should also leverage the topics and keywords that have performed well in the past. Keyword research and search engine optimization (SEO) has gained massive popularity and industry-wide adoption over the last 10-15 years. Why? Because people query search engines like Google billions of times per day. In the primitive days of SEO one could simply research the top 100 keywords for their industry, stuff them into the meta keywords tag and instantly improve search engine rankings. Fast-forward to SEO in 2018 and Google’s algorithm has gotten exponentially more intelligent (and complicated) to optimize. Although many of Google’s ranking factors still remain important, there are new players we need to keep in mind while we build our content strategy. The two new SEO factors we’ll discuss in this guide are topical authority and user experience signals. We’ll cover topical authority now as it relates to how we develop a content strategy and discuss user experience signals when we arrive at developing content. Domain Authority has been a key determinant of where websites ranks on the Search Engine Results Page (SERP). Authority is a measure of how trustworthy and reputable your website is. Authority is calculated by weighing the number and quality of backlinks pointing to your website. These links or “votes of confidence” from trustworthy websites allow Google to safely return results for a query. In the past, webmasters could publish lots of web pages that discuss the same keyword and see massive results. The success came from Google’s ranking algorithm that weighed keywords found in the URL, title tag, headers, body, and meta description of your page. Now, keyword authority has taken a back seat to new ranking factors like relevance coefficient and topical authority. Google’s algorithm takes into account every keyword that is semantically related to the query in order to return the best results. In order to return pages that are most likely to solve the searcher’s intent, “search engines identify your content’s context and synonyms related to your keywords,” through Latent Semantic Indexing. What’s the takeaway? Include synonyms of your primary keyword to help search engines understand the context of your web page. So, what does topical authority mean for my content strategy? Topical authority insists we design high-performing pages that cover the entire keyword topic if we want our domain to rank for a competitive keyword. How do we become topical authorities? Creating topic clusters. Pioneered by HubSpot, topic clustering is the method of organizing your content for the benefit of both search engines and humans alike. The content topics your business chooses will rely heavily on the markets you serve and the products and services you offer. For example, University A wants to leverage the power of Strategic Marketing to increase enrollment for their Executive Master’s in Leadership degree. During their keyword research phase they identify “leadership development” as a keyword with commercial intent, high monthly traffic, and relatively low keyword competition. Pillar pages can be considered a hub of information with each spoke representing a link to another article on your website that offers more detailed information on the given subtopic. University A would build a pillar page at www.UniversityA.edu/leadership-development to host all the information a visitor would need to read to understand leadership development. In our experience, if you’re starting from scratch, it is best to write the pillar page first. Your pillar page will cover all the subtopics you identified with a brief summary and any external links to authoritative pages. This exercise will help inform the contents of your in-depth subtopic articles. If you have a lot of content, but it is not organized into topic clusters, check out some example pillar pages and then audit your blog to define the topics you want to be an authority on. After your audit and some keyword research, you should be able to group your blogs into topic clusters, develop a pillar page, and identify additional sub-topics to write content for. After you’ve defined your primary keywords, drafted your pillar page content, and started developing your pillar page, it is time to write your supporting articles. Once a new piece of content is written and published, make sure there is a link between the content hub (pillar page) and supporting web page. That way someone who lands on either page can navigate freely between them. Now that we have a good idea of how to organize our blogs and become a topical authority, it is time to get into the nitty gritty work of performing keyword research. Keyword research plays an invaluable role in determining the best keywords for your pillar pages and the additional topics you need to cover in order to call yourself a topical authority. Head keywords are typically single word keywords with lots of search volume and are extremely difficult to rank for. That being said, it is extremely important that you know the head keywords to include in your short-tail and long-tail keywords. For example, a head keyword for University A would be “degrees” or “program” since our target audience is looking for leadership degrees and leadership development programs. Short tail keywords or body keywords are more specific than head keywords, receive high amounts of search volume, but can be challenging to rank for. Example short tail keywords for University A might include: “leadership degrees”, “leadership skills”, “leadership styles”, etc. Long tail keywords are typically a string of three or more words, specific, have lower search volumes, and lower competition. For example, long tail keywords for University A might be, “leadership development programs for managers”, “types of leadership degrees for healthcare professionals”, “how to choose a leadership development program”, etc. Niche keywords, in some ways, are latent semantic keywords, and they map nicely to our supporting articles for our topic clusters. On average, niche keywords will have lower search volumes, lower competition, but are more specific to our target audience’s search intent. For more information on the different types of keywords and to learn how to build a list of niche keyword topics, our favorite thought leader, Backlinko, has a great guide to keyword research. Before we dive into finding niche keywords and keyword research tools it would be best to discuss commercial intent also known as keyword intent. Behind every search query there is something called “searcher intent”. Optimizing for search intent is what distinguishes high performing content marketing from the rest of the pack. 1. Transactional Intent - when a searcher intends to make a purchase. Search queries that are transactional in nature typically include terms like “buy”, “coupon”, “discount”, etc. 2. Informational Intent - when a searcher looks for answers to a given problem. Search queries that are informational typically include terms like “review”, “best” or begin with phrases like “how” or “why”. Commercial intent is important because the marketing funnel stage you’re focusing on determines whether or not a potential keyword is a good target for your content marketing. 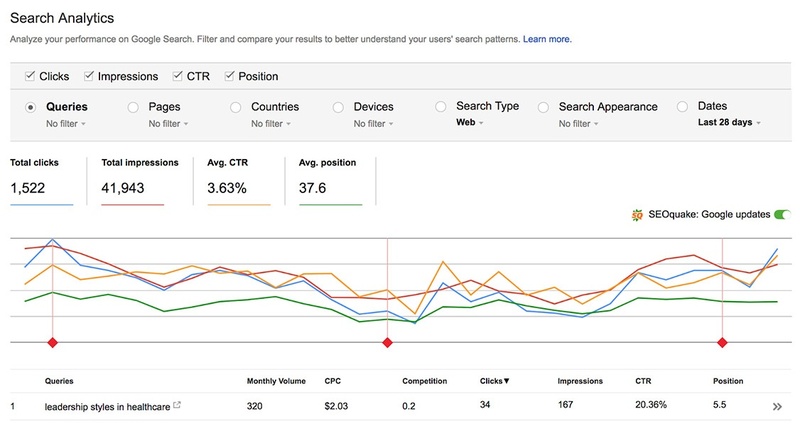 Lean too heavily on transactional search queries and you’ll miss out on new visitors. Lean too heavily on informational content and you might not convert visitors into leads and customers. Instead of just listing tools and explaining how they can be used to perform research, we’re going to walk you through key steps in our process. Google’s Search Console is the best place to start for generating a base list of keywords. Why should you use search console for keyword research? Because it shows you the exact queries, landing pages, and engagement metrics of people who find your website. If you haven’t configured your website with Search Console, we recommend you verify your domain immediately so you can start discovering your business’ top performing keywords. If you scroll all the way to the bottom you can download a .CSV file of all the keywords and engagement metrics from your website. With this spreadsheet you can quickly identify some head and body keywords for more in-depth research. As we discussed earlier in Chapter 2: Content Strategy, it is best to write your pillar page first. In this section we’re going to discuss how to optimize your pillar page for optimal search engine optimization and design content for maximum engagement. Although the weights of on-page elements such as URLs, titles, and headers have decreased in favor of engagement metrics like dwell time and click through rate, they still play a large role in how to design your content for maximum SEO. The URL should include your target keyword with spaces replaced with hyphens. The title of your pillar page and blogs should include the target keyword, and should also be written in a way to capture your target audience's attention. Note: Titles should be less than 512 pixels in length (or around 65 characters) so they are displayed correctly on desktop and mobile phones. To check if your title is the correct length, use a page title pixel meter like the one from Web Shop Optimizer. Headers should concisely explain what the reader can expect to find. The headers on your pillar page should represent the supporting blog. Pillar pages should be organized in a logical, hierarchical manner. For example, an H2 would be “Leadership Development Programs” and H3s nested under the H2 would be “Executive Leadership Programs”, “HR Leadership Development Programs”, and “Leadership Development Programs for Managers”. In late 2017 Google announced that the meta description length was expanding from the original 160 character length and the length of meta descriptions in 2018 can safely be written up to 230 characters. The meta description should be optimized for Click Through Rate (CTR) and not for keywords. The goal is to write a description that captures the searcher’s attention, and concisely addresses the searcher intent. Optimizing your website with images will help your content perform in many ways, from keeping readers engaged and increasing dwell time, to providing meaningful context. Read our guide on optimizing images for content marketing for step-by-step instructions. In the past, the presence of keywords and quality backlinks were the two primary ranking factors that determined where a particular website or page fell on the Search Engine Results Page. In 2018 and beyond they’ll take a backseat to engagement metrics. Engagement metrics are used by algorithms to judge how useful a particular piece of content is in solving the searcher’s intent. In this section we’ll discuss how to design content for the top four important engagement metrics: organic click through rate, dwell time, bounce rate, and conversion rate. Organic Click Through Rate (CTR) is a measure of how often a visitor clicks your listing on the SERP and continues exploring your website. As you can see from WordStream’s graph, pages with higher CTR are ranked higher more often than pages with lower CTRs. To increase organic CTR from the SERP, its important to write engaging titles and meta descriptions that detail exactly what the visitor can expect to find if they click your listing. Remember, meta descriptions do not intrinsically carry SEO value, but are paramount for click through rates. For example, if your article is based on an informational keyword that solves a specific problem, include the who, what, why, when, and how in your meta description. If your article is a transactional keyword like comparing different products, you might want to include the key features you’ll be comparing between those two products. 1. Use the APP method - Agree to your visitors concerns, Promise that when implemented correctly your recommendations will solve the searcher’s problem, and Preview what the reader can expect to gain if they continue reading. 2. Create consumable content - This can be done by writing in short paragraphs, leveraging white space, and incorporating meaningful images to draw the readers eyes down the page. Being a great storyteller helps too. 3. Address the Searcher’s Intent - Before you even write a word of a blog post you should have a clear understanding of who you’re targeting and the problem they’re looking to solve. By addressing searcher intent in your meta description, in the intro paragraphs, and throughout the body content you can keep readers on your page longer. 4. Leverage Internal Linking - Pillar pages accomplish this by summarizing the key elements of your content topic and linking out to robust articles on each sub topic. Internal linking helps visitors navigate your website to find answers to their most demanding questions. Bounce rate is defined as the rate at which visitors land on your website and bounce back to the search engine results page without clicking through your website. 1. Avoid pop-ups and blog layouts that distract visitors from the content. This includes excessive sidebars and irrelevant CTAs. 2. Ensure external links open as new windows. The last thing you want to do is send people away from your website. It is important to have some external links on your website because it adds credibility and trust. 3. Optimize your website for mobile. Over 50% of Google searches are done from mobile devices. By optimizing your website for mobile and decreasing page load times, you can keep mobile visitors on your site longer. Conversion rate is the rate at which a website visitor takes a desired action. Typical conversions are subscribing to a newsletter, downloading a content offer from a landing page, calling a business on mobile, filling out a contact form, requesting an estimate, or sharing your article. 1. Use Social Proof - add testimonials to your pricing pages, show the number of people who shared or downloaded your content. 2. Humanize your brand - people connect with people. Use a personal tone so visitors have an easier time connecting with your brand and form positive cognitive biases. 3. Build a brand platform that achieves authenticity - Know your brand position, brand personality to align your mission and vision to create content you believe in and not just saying what people want to hear. 4. Making Converting Simple - minify the fields required to convert a new visitor. The amount of information required to download a content offer should mirror the value of the content. For example, a program brochure could be as little as four fields: name, email, phone number, and their program of interest. At this point we’ve written our pillar pages, designed our content for SEO and engagement metrics, and clustered our topics. Now it is time to promote our content. Anytime you create new content, it should be promoted to your current audience through email. If you’ve been applying our suggestions to your website, you should have a solid email list of leads and customers. Promoting content through email gives you the opportunity to engage your earned audience. Before you blast your content to every contact in your database it important to segment your contacts so you can send the right content to the right person at the right time. Contacts can be segmented in a variety of ways. We’ll cover two of the most important ones, persona and lifecycle stage below. Depending on the content you’re sharing, you may want to tailor the message of your email differently for each audience. Personalizing your subject line and email body content based on their persona will help increase your open rates and click through rates. Depending on the type of content you’ve created, only some of these contacts should be receiving your content, and the message and Call-to-Action within your email should also be personalized to where your contact is within your funnel. 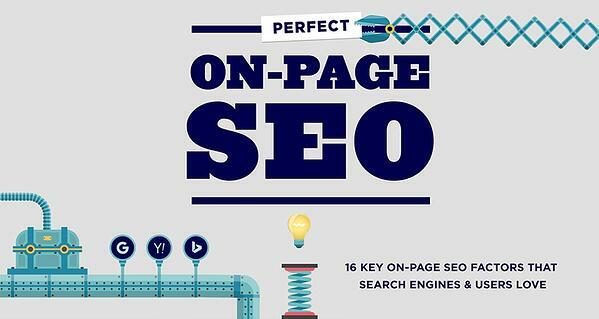 Off-page SEO is a key part of content promotion. One of the best ways to increase the search visibility of your content and earn referrals is through backlinks. A backlink is whenever a website links to your content from their website. Backlinks help your content move up the Search Engine Results Page (SERP) and also introduces your brand to frequent visitors of the website that is linking to you. When you gain an inbound link from authoritative websites it demonstrates to Google that your content is relevant, and high quality. Each backlink is a “vote of confidence” that gives your brand credibility which in turn boosts the authority of your webpage. Every website should have a good balance of nofollow links and dofollow links. Nofollow links do not pass SEO equity from one domain to the other. Nofollow links are commonly found when you link content on websites like Quora and in Press Releases. Dofollow links on the other hand pass SEO equity from one domain to another. Dofollow links occur when an independent website property links to your website. Building relationships with authoritative sites and industry thought leaders through social media, blog comments, email conversations and real life conversations is a great way to, not only build links, but to learn and become a respected source of information. Write a concise email to websites or thought leaders within your industry who’s audience would benefit from syndicating (re-publishing) your content or promoting on their social channels. Go to Quora and search for questions that your content answers. Address the person’s question and leave a link to the piece of content you just published. You’ll earn a no-follow link and, if your answer is helpful, will lead people to your website and may even get picked up by other blogs. Did you just design an awesome infographic or illustrated guide? Go to Reddit and share it on r/infographics and r/coolguides. These subreddits are home to over 72,000 and 325,000 members respectively. Search for popular websites or blogs your audience might be interested in, and then search for content on a related topics. Leave a polite comment on the post with a link to your article. This can also be used on trending LinkedIn, Facebook, and Twitter posts. Comment marketing is a powerful method for driving new visitors to your website and earning links. Content syndication means sending your blog, site, or video content out into third-party sites. This can be done via email or a submission form on a website related to your industry. For example, if our fictional University published an article on the ROI of a graduate program they may want to submit it to The Chronicle of Higher Education. Additionally, you can repost a slightly modified version of your article to publishing platforms like LinkedIn Pulse and Medium. Using a paid content amplification strategy can be extremely effective once you’ve done your research. You’ll need to know what websites your audience is on and what social media channels they use. Most content marketing strategies should include social media as one of their publishing channels. If you have an advertising budget, spending as little as $50 to boost a facebook post can help extend the reach of your content. If your content is designed well and your boosted post is targeted, then driving people to your content and having them engage with it will also help accelerate your rankings. Native advertising is a form of paid advertising that promotes content “in-stream”. One type of native advertising is sponsored content you’d see on Facebook, Twitter, or on a blog. Native advertising is an effective method for driving traffic to your target audience without disrupting their user experience like traditional advertisements. With everyone’s focus tuned into digital marketing, one content promotion channel that often gets overlooked is press releases. If your company just published original research or created a great piece of informational content, using a press release to promote content helps websites and journalists pick it up and redistribute it to their networks. When deciding what channels to promote your content on it’s very important to identify what platforms your personas use. Survey your audience members and conduct industry research to see which platforms thought leaders in your industry are using and how they’re using them. For our fictional university we understand our undergraduate audiences prefer social platforms like Facebook and Instagram, while our graduate students are more active on professional networks like LinkedIn. One tactic that we’ve used to get our content in front of our ideal audience across different social media platforms is sharing our content within specific groups. Because we know who our target audience is, we can search for professional LinkedIn groups where they will likely be looking for helpful information and post content within those groups. After you’ve put so much effort into building a robust content strategy, researching your keywords, and developing your content, don’t skimp on promoting your content. You spent all this time and money creating a great piece of content and you’ve promoted it. Time to move onto the next piece right? Wrong. If your content is performing well, you might have yourself a “ marketing unicorn”. What’s a marketing unicorn? 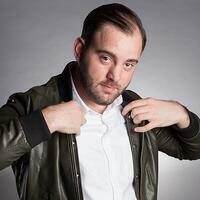 The sad truth is that not all of your marketing campaigns will be winners. Marketing unicorns are your top 1-3% of content that drives a majority of the traffic. If you have a marketing unicorn on your hands you need find creative ways to repurpose it into new formats. This helps you attract new audiences and increase your ROI. Below are a few ways you can repurpose content from one format to another. White papers and eBooks usually house a ton of great information, but not everyone has time to read a 5,000 word eBook on the differences between leadership development programs. But they probably do have five minutes to skim an infographic. Not everyone has time to read a 5,000 word eBook on the differences between leadership development programs. But they probably do have five minutes to skim an infographic. Infographics are highly-shareable pieces of content that spread like wildfire on platforms like Facebook, LinkedIn, Medium, Reddit, and Quora. SlideShare is a publishing platform run by LinkedIn specifically for sharing presentations. If you have an infographic and a white paper, highlight your key points in a 10-20 page presentation and upload it to SlideShare. Like infographics, slide decks are consumable content assets. If you have an infographic or an eBook, integrate them with your workflow automations so that every time a website visitor converts on your website, they receive a piece of evaluation stage content and are nurtured towards becoming a customer. Strategic repurposing of content in email automation workflows is one of the many reasons why we are ranked as a top 25 Email & Marketing Automation agency by DesignRush. Do you have 15 minutes and a camera? Great! Film yourself discussing the key points of your white paper or most popular blog. Upload them to YouTube, embed them in the original blog post, and re-share them on social media platforms for even more engagement. If your audience is responding well to the topic of your eBook, consider hosting a webinar on the same topic. 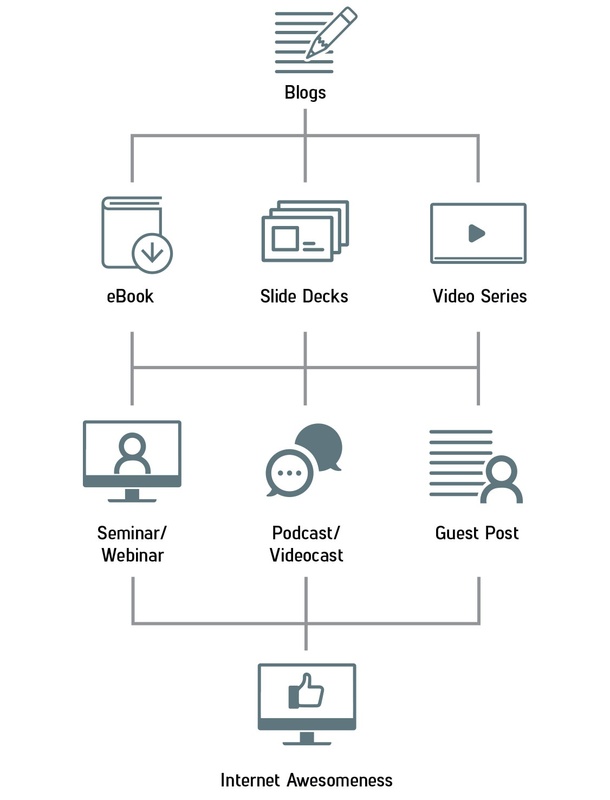 Webinars are great for educating your audience and they often attract people who are further along in the funnel than someone who downloads an eBook from your website. When you host a webinar, make sure your webinar is being recorded. That way, once the webinar is over you can email the recording to participants who couldn’t attend. You can also upload it to YouTube, add it to your resource library, share on social, and integrate it with your marketing automation workflows. If there are any great questions during your webinar you can cut your webinar into 1-2 minute clips and create a video FAQ section for your website. The key for content marketing success in 2018 is to find the topics that are most important to your audience at each stage of the Strategic Marketing Methodology, establish yourself as an authority by creating content that covers your topics in great detail, promote your content, and repurpose your top performing content into as many creative media formats as possible.